Maltodextrin, potato starch, sugar, rice flour, salt, palm fat, yeast extract, tomato puree powder, onion powder, green pepper (1.7%), black pepper (1.5%), caramel syrup, thickener (guar gum), flavourings (contain MILK), beetroot juice powder, acid (citric acid), paprika, herbs (parsley, thyme), white pepper, parsley root powder, cloves. May contain gluten, egg, celery and mustard. 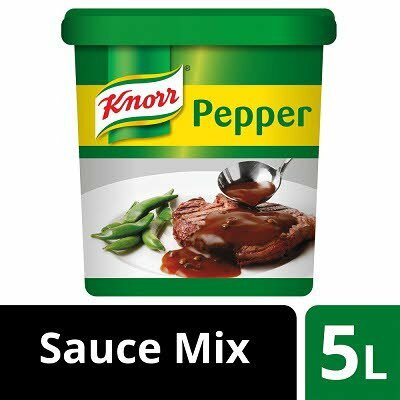 Stir 120g in 1 litre of boiling water.Stir well to mix and simmer for 2 minutes.Add cream to make a creamy pepper sauce.